Spotty Bulbears (クマチャッピー?, lit. 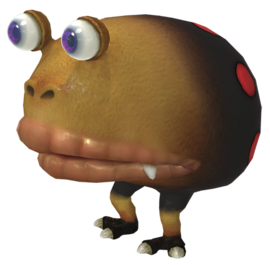 : "Bear Chappy") are creatures in all three Pikmin games that resemble Red Bulborbs with a different color and stature, and larger mouths with wider lips. They are black with red spots, and their face is a creamy yellow. Its large mouth allows it to eat Pikmin more rapidly and easily, making it a rather formidable foe. These enemies are often found with a number of following Dwarf Bulbears, which are supposed to follow this guardian as a source of protection and general aid. In Pikmin, these creatures sleep if left alone, and have bloodshot eyes upon waking up. They have about one and a half times more health than a Red Bulborb, and their red spots constantly change in size, even after death. Returning a dead member of the species to an Onion produces 15 Pikmin sprouts, but the crushing glitch may make carrying its body difficult in this game. They do not revive after they have been killed, but they regenerate if the player takes too much time to kill them. In Pikmin 2, Spotty Bulbears have far greater maneuverability than other members of the same family, as well as a less focused patrol area; they have the ability to move almost anywhere in most areas, below as well as above ground. They can be found in the Perplexing Pool after the thirtieth day, and may even enter the landing site. If the creature is defeated and its corpse remains, its health will steadily grow back, the creature reviving itself; after what may be minutes, it may return to consciousness, requiring a repeated "kill", similar to the Gatling Groink. For this reason, it is recommended that the body be quickly returned to an Onion or the Research Pod, or that the sublevel is exited quickly. They have lost the ability to revive. When a Bulbear snatches Pikmin, it stops to fling them into the air and land them down its throat. Then, it pauses for about two seconds and may burp. This small sliver of time should be enough for a wary player to escape or attempt an attack. Bulbears now emit a heavy, snarly breathing noise when giving chase, which can be heard from a distance, alerting players of their presence. When in a dark area, their glowing purple eyes can also be seen from a distance. If a Bulbear spots the player, it will now give a glance at the group, making it much easier to tell if the Bulbear can see its prey or not. In addition to all this, they can be momentarily stunned by being hit in the eye like all grub-dogs in Pikmin 3. The exact same strategy for the Red Bulborb is effective here, but take care of the Bulbear's increased health. A large group of Red Pikmin or three bomb-rocks will do it in. Spotty Bulbears are always awake in this game and are constantly roaming the map, making a surprise attack nearly impossible. It is possible to trick the Bulbear into attacking and missing, allowing the leader access to its backside, but they frequently have Dwarf Bulbears following them, making this tactic risky. Another means of accessing its rear is to split the leaders, using the one without Pikmin as a distraction. If Purple Pikmin are available, they make the battle easier as they can injure and stun the adult and children, but with other types it may be wise to use an ultra-bitter spray. It is often effective to switch roles with and hunt the Bulbear itself before it can pick up any Dwarfs, and then stun and attack it. If time is not a concern, leaders can be used to punch and kill the Dwarf Bulbears and even the adult without the risk of losing Pikmin. The Rocket Fist upgrade makes this especially easy. In the Perplexing Pool, you can trap the Bulbear in between the wall and the small maze next to the bridge. It will be unable to get out, so it won't be an issue anymore unless you want to kill it. Just begin to rain Pikmin down on its head, it should shake once or twice before dying. You then can carry its corpse and the 10-pellet it dropped out of the area and they will be able to get to the Onion. In most caves, leaving a Pikmin on one side of the wall that the Bulbear cannot reach allows a slight edge. Be quick and you can severely damage, if not kill it, with few losses. To defeat the Spotty Bulbears in the Subterranean Lair in Challenge Mode, lure all three close to one another, then hit them all with a single shot of ultra-bitter spray to petrify all three at once, hopefully along with the dwarf compainions. Since Bulbears follow the active leader, they can be lured into falling into bottomless pits that are between the leader and the beast. Any treasures the creature would drop will be, unlike in Pikmin, safely returned to the sublevel for collection. One such level is sublevel 3 in the Dream Den. If you want to get rid of the posse of dwarfs following the Spotty Bulbear, you can bring twenty Purple Pikmin and sneak up on the farthest dwarf in the group. Throw the purple on its back and it will die instantly. Do this to all the dwarfs without the Spotty Bulbear "noticing" and then you can defeat it with ease. A Spotty Bulbear appears inside a dark cave in the Distant Tundra. It is accompanied by the usual Dwarf Bulbears and some Fiery Blowhogs. In the cave, there are 10 bomb rocks. It will take 3 bomb explosions to kill the Bulbear, but if the Bulbear eats a bomb rock (regardless of whether or not a Pikmin is carrying it), it will instantly die. The remaining bombs can be used to deal with the other enemies. For a head-on attack, make sure all other enemies are dead before facing it as otherwise shaken off Pikmin may become eaten or set on fire. Chuck Pikmin at its eyes until you hit them. Don't throw any more Pikmin until it's ready to attack again. This keeps it flinching over and over. Whistle some Pikmin when your standby group is small. Rock Pikmin and Red Pikmin can help defeat it quicker, as can an ultra-spicy spray. If it does eat Pikmin, it chucks them in the air and may burp afterwards. This time is enough to escape or whistle the Pikmin back to hit its eyes again. The name "Spotty Bulbear" is a counterpart to the name "Spotty Bulborb", which is what the Red Bulborb was identified as before the release of Pikmin 2. The word "bulbear" is an alteration of the word "Bulborb" such that it ends with "bear" instead; this word reflects this creature's much bruter nature. Its Japanese name, クマチャッピー?, literally means "Bear Chappy". The scientific name, Oculus terribilis dotticum, uses the species name terribilis, which is Latin for "terrible", and dotticum as the subspecies, which resembles the English word "dotted". In an early English script left inside the game's disc, the technical name used to be just Oculus terribilis. The creature's internal name in Pikmin is swallob, which could be seen as a change on the Red Bulborb's name (swallow), as to mean "swallow B", or the second type of enemy with the "swallow" internal name. The internal name in Pikmin 2 and in Pikmin 3 is the same as its Japanese name: kumachappy. Spotty Bulbear in Pikmin, its red eyes visible. A Spotty Bulbear in the enemy reel. A Spotty Bulbear as shown from the Piklopedia. A Spotty Bulbear as seen in Pikmin 3. A Spoty Bulbear in the darkness. A Spotty Bulbear on the Thirsty Desert. Animation showing the spots on its back changing in size, in Pikmin. A Spotty Bulbear in an earlier version of Pikmin 2. The Spotty Bulbear in an unused cave used for testing its A.I. The creature's e-card, #07 (9th red card). A Spotty Bulbear burping in Bingo Battle. A Spotty Bulbear burping after a meal. In the enemy reel in Pikmin, Bulborbs are present in places that Bulbears inhabit in the finished game, suggesting that this is how it was in a development version. Also in the enemy reel, it says that the enemy has a certain indefatigability (meaning it's seemingly incapable of being tired), which is strange, since the enemy sleeps most of the time in this game, and the only other thing related to fatigue is the revival mechanic, but that was only introduced in Pikmin 2. The Spotty Bulbear was one of four enemies that were planned, but ultimately removed, for the roulette wheel in Pikmin 2's 2-Player Battle, along with the Antenna Beetle, and the Fiery and Caustic Dweevil. An unused cave with a maze-like single floor was used to test the Spotty Bulbear's AI in Pikmin 2. This cave can be found in the game's files, and its caveinfo name is known as 敵チェック (meaning "Enemy Check"). If a Spotty Bulbear bumps into a member of the grub-dog family that is sleeping, it will wake them up. Ironically, this is not the case with the Orange Bulborb, which otherwise wakes up easier than the remaining members of the family. This behavior can be seen on sublevel 9 of the Hole of Heroes. The Spotty Bulbear and the Gatling Groink are the only enemies that can revive in Pikmin 2. Oddly, Dwarf Bulbears, which are just the same creature at a young development stage, cannot. Their eyes, like their younger counterparts' eyes, have different colored pupils each game: red in Pikmin, indigo in Pikmin 2, and purple in Pikmin 3. This page was last edited on March 2, 2019, at 20:00.